Son of drum legend Ginger Baker brings to the stage the closest live experience to the legendary Cream possible! 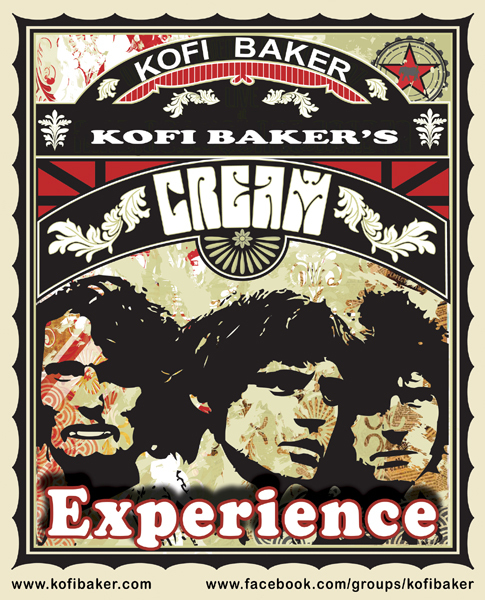 5/7/2012 – Los Angeles, CA – Fans of the legendary power trio Cream rejoice with the announcement of Kofi Baker’s Cream Experience North American tour commencing May 31st. Kofi Baker, following in the family tradition, displays a mastery of drum technique and groove that rivals that of his father, drum legend Ginger Baker. After seeing the historic Cream reunion in 2005, Kofi was inspired to start his own band – he wanted to continue where Cream, and his father, left off. Kofi’s band is the ultimate Cream tribute: combining Cream’s innovative and experimental style with virtuoso talent. The trio capture the mood and energy of the late ’60s and early ’70s; adding their own distinctive styles. Kofi’s upcoming tour comes off the heels of his whirlwind trip to SXSW in Austin, TX where he was promoting the award winning documentary ‘Beware of Mr. Baker’, a film about his famous father Ginger Baker, which received the prestigious Grand Jury prize for its category. Kofi, who’s first stage appearance was with his father at the age of six when they performed together on the BBC TV show ‘The Old Grey Whistle Test’ in 1975, was also interviewed for the ‘Beware of Mr. Baker’ documentary. Over the years Kofi Baker has become a well-respected drummer in his own right having tour with artists such as legendary Steve Marriott of Humble Pie, John Ethridge of Soft Machine and Steve Waller of Manfred Mann, as well as touring Europe with his father during the early ’80s playing drum duets of complex African polyrhythms. In the ’90s Kofi teamed up with Jonas Hellborg and Shawn Lane to record the album ‘Abstract Logic’. Along with working on a new solo album, Kofi in recent years has been recording and touring with the band OHM, fronted by Chris Poland, former guitarist with Megadeth. Kofi has also recently become Head of the Drum Department at the Artisthead New Music Academy.